Vernacular, a photo by shirokazan on Flickr. When I moved to Scotland and had to learn to understand the natives, I was of course aware of the existence of Scots, but I assumed (wrongly!) that people at any one time would normally speak either Scots or English (or rather, Scottish Standard English [SSE], which is standard English with a Scottish pronunciation and a few loanwords from Scots, such as wee, dreich, outwith and glaikit). However, I was rather disappointed that I almost never met any speakers of Scots, and at the same time SSE speakers often seemed to mumble — for instance, foot sometimes sounded more like /fɪt/ than /fut/ [fyt] (the expected mapping of RP /fʊt/). Other examples included you sounding like /ji/ rather than /ju/, use (the verb) sounding like /jez/ rather than /juz/, dog sounding like /dʌg/ rather than /dɔg/, and thirty sounding like /θɛrte/ rather than /θɪrte/. Strangely, whenever I asked people to repeat one of these words, they invariably produced the vowel I had expected in the first instance (e.g., /fut/, never /fɪt/). The alternative to my theory that all Scots were mumbling was to assume that the SSE phonemes had extremely varied and overlapping realisations — in other words, I speculated for a while that /u/ perhaps could be realised as [u, y, ɪ, i, e]! However, that’s obviously not true — while foot can be [fɪt], [fut] and [fyt], it can’t be *[fit] or *[fet], and so on. Things didn’t click into place until I started learning Scots as a foreign language. When I learnt that the Scots words for foot, you and use were fit, ye and uise (pronounced as if it had been written yaize), it suddenly became clear that many SSE speakers were just using many more Scots words than I had realised, rather than mumbling English words as I had been assuming. Once I had sussed this, several of my Scottish friends that I had till then perceived as mumbling SSE turned out to be speaking very clearly but using a lot of Scots words. In other words, not only had I been wrong about the mumbling, but I had also completely underestimated the usage of Scots — it’s just the case that it’s normally used mixed up with English rather than as a separate language. Foreigners moving to Scotland should definitely learn some Scots. It’s not just the language of Burns and many other great poets, but it’s also currently mixed up with English in everyday conversations throughout Lowland Scotland, and it’s hard really to understand what people say without being bilingual in Scots and English like them. 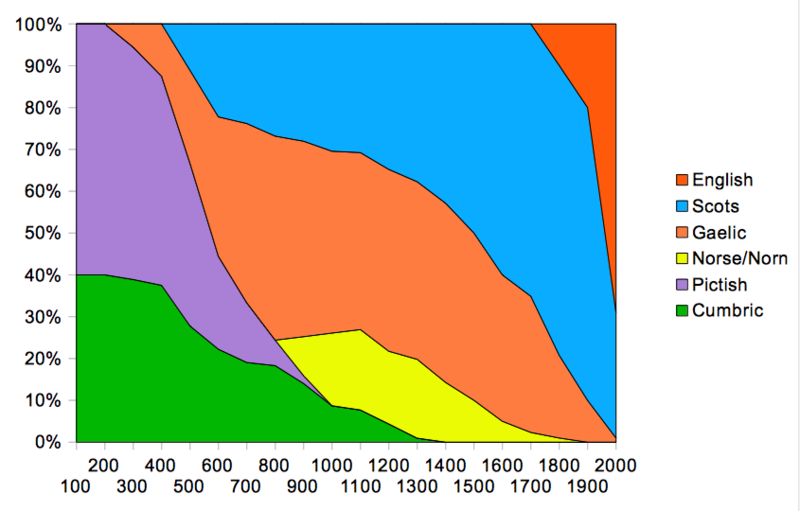 Languages in Scotland over the past two millennia. One of the things I like about Scotland is that it has never been a monocultural place — it has always been a melting pot. Let’s look at the languages of Scotland as an example (I am a linguist after all!). Today the main language of Scotland clearly is English (or rather Scottish Standard English) — everybody knows it, and it’s the main language of government, education, etc. However, according to the latest census, 1.5m people (out of 5m) also speak Scots, a closely related language (the distance between Scots and English is a bit like Danish and Swedish). However, it hasn’t got much support in the education system and it’s often stigmatised. Both English and Scots are of course derived from the language of the Anglo-Saxons, who immigrated to Great Britain from what is now Denmark and Germany more than 1500 years ago. 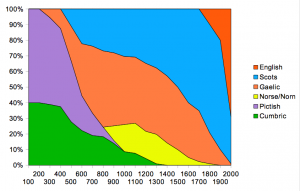 The third of the extant languages is Gaelic, which has only got 50k speakers left. Many people seem to think that it’s Scotland’s original language, but this is only really true in the sense that it was the dominant language at the time of the unification of Scotland. 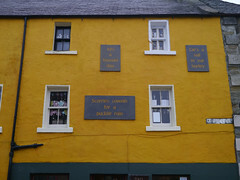 Gaelic is also an immigrant language and has its roots in Ireland. For centuries, another Scottish language was Norn, the descendant of Old Norse, the language of the Vikings. It was spoken in large parts of Highlands and Islands for a while, but for the last few centuries of its existence it was confined to Orkney and Shetland. The last speaker died around 1850. [Visiting Scotland by train] also takes us through the lands of “Yr Hen Ogledd” (the old north), the heartland of the old Brythonic language, the prototype of modern Welsh and the seven kingdoms which established themselves in the intervallum of several centuries after the Romans left these shores in 400 AD. The old Brythonic names of these kingdoms such as Ystrad Clud (Strathclyde), Galwyddel, (Galloway), Aeron (Ayrshire) and Lleddeiniawn (Lothian), are instantly recognizable to a modern-day Welsh speaker, and being confronted with a cultural link which stretches back over well over 1,000 years cannot fail to touch one deeply. Finally, the language of the northern two-thirds of Scotland used to be Pictish, which was probably related to Cumbric (although we don’t know for sure). The historical records don’t allow us to go back any further, but Cumbric and probably Pictish were Celtic languages, and Celtic is a branch of the Indo-European language family, which means that these languages too must have been immigrant languages at some point (the Indo-European languages probably originated near the Black Sea). Alas, we don’t know which language(s) they replaced. 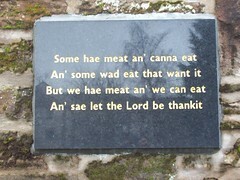 All we know is that Scotland has always been multilingual. The fact that the 2011 Census provides figures for the number of Scots speakers in each council area makes it possible to estimate speaker numbers for each dialect (if we assume that people speak their local dialect, which of course won’t always be the case). In some cases there’s a perfect overlap (e.g., between Orkney and Shetland and the Insular Scots dialect), but in many cases I’ve had to split a council area in half, so the numbers won’t be very precise. Bearing those caveats in mind, the numbers I came up with are as follows: West Central 551,984; South East Central 277,836; Mid Northern 230,380; North East Central 221,027; South Northern 101,913; South West Central 75,501; Southern 34,873; North Northern 24,226; Insular 19,266. 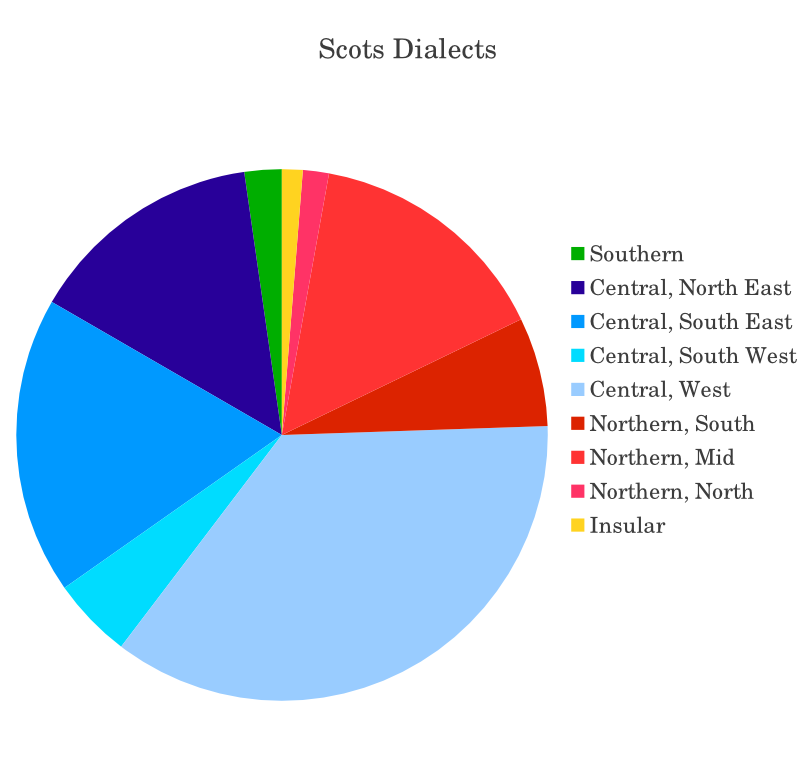 It’s interesting that the Central dialects (roughly the ones spoken in the Central Belt) account for nearly three quarters of all Scots speakers. Scots speakers in 2011. Data from the census, base map from Wikipedia. 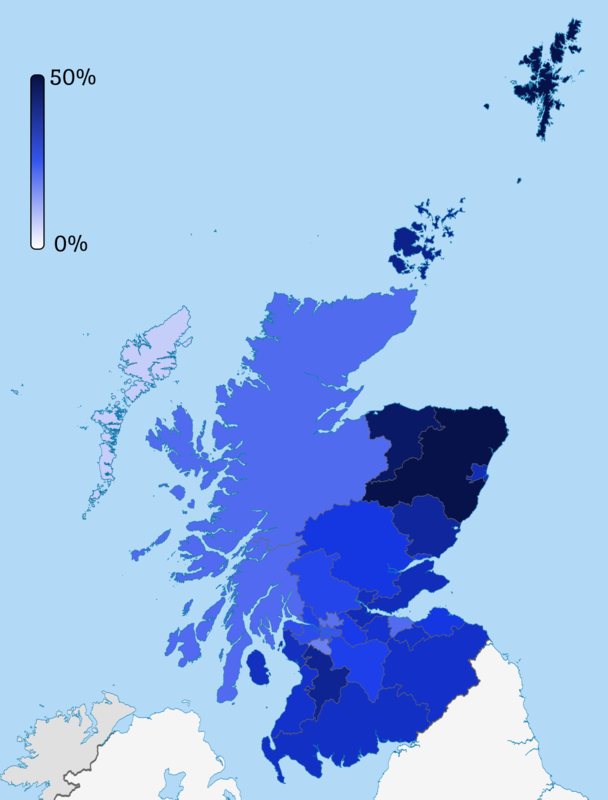 Today saw the release of more results from Scotland’s 2011 census, in particular about languages. The decline of Gaelic seems to have stopped — the number of speakers dropped very slightly, but it rose amongst young people, so that’s excellent news. For the first time ever, the census asked also about Scots, the Germanic language spoken in Scotland. More than 1.5m people declared that they were able to speak Scots, which is a lot for a language with hardly any official support. At the moment there are no Scots-medium schools, no Scots TV channel, no Scots radio channels. I’ve made a map showing where the speakers of Scots are located within Scotland. It’s interesting how the areas with very few Scots speakers are either Gaelic-speaking (Na h-Eileanan Siar) or posh (East Renfrewshire and East Dunbartonshire). The map doesn’t take population densities into account, so the council area with the higher number of Scots speakers is actually Glasgow, in spite of its relatively pale colour. Hopefully this census will be the starting point for the revival of the Scots language. It’s such a beautiful, rich and nuanced language that it would be a real shame if it ever died out.